Your last chance to grab an extra special deal. We have reduced our prices on all these sets, so hurry. When it's gone it's gone, so don't miss out, order today. This is where you will find our best deals on items across our entire product range. Ex-display models, mostly used only in photography for our website, are offered to you at fantastic prices. Stock is limited so grab it when you can! A 6 seater garden table set is a popular choice for the average household. Not overly large, but spacious enough for lunch or dinner outdoors: our 6 seater modern garden furniture fits this description. All our 6 seater modern garden tables are extendable, providing added functionality that helps you save space in your garden or patio, without sacrificing the ability to seat up to 6 people. As always, high quality materials are the core of our 6 seater modern furniture range. All our tables are made from < href="https://www.lazysusanfurniture.co.uk/cast-aluminium-furniture/">cast aluminium, some featuring a glass table top. In this range, the chairs are cast aluminium combined with a durable, outdoor mesh fabric. The Lottie table is one of our finest pieces of modern black garden furniture. This sleek yet robust table extends from 160cm to 210cm. The Lottie table is a fabulous example of a table that can works well either as indoor or outdoor furniture. Then we have the Florence table is a wonderful modern extendable dining table with a glass table top. The Florence table comes in all the same colours as the Violet table. 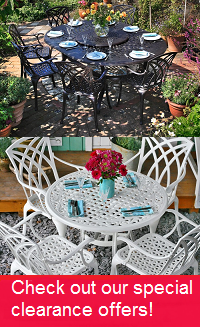 All of our contemporary style garden tables come with robust, cast aluminium stacking chairs. The Lea or Milly chairs are usually the default options, but you have the option of selecting an alternative. You could also pair the Georgia or Abigail chairs with your table for between £10 and £25 per chair. Depending on the table you’re looking at, your chair may even be available in a couple of different colours. Don’t forget to take advantage of our amazing offers before moving on to the checkout page. We offer some fabulous discounts on all kinds of garden furniture when you’re purchasing a modern 8 seater furniture set. Get up to 70% off of a sun lounger, garden bench or side table! You may well find something that compliments your new modern metal garden furniture. If you’re looking for a bargain, take a look at our clearance page, too. There are fantastic deals to be had on everything from sun loungers to 10 seaters. The deals you find here won’t be repeated. We offer free delivery on all our modern garden table and chairs sets. So there’s no need to worry about additional charges on the checkout page. Our 6 seater modern table and chairs sets are delivered as a large package or on a wooden pallet by our partner couriers Parcelforce or Geodis. Both offer online tracking of your order from the day of dispatch. Geodis will also call you the day before delivery to arrange a time slot that works for you. For more details about delivery you can have a look at our delivery information page or give us a call. For any questions about our quality aluminium furniture, the friendly Lazy Susan team is on hand to take your call or answer your email. From 08:00 to 18:00 daily, they can provide more information about our products. Call us on 01243 717107 or email us at [email protected]. We try to answer emails within 2 hours during office hours. Robert in Tadworth, Surrey has just ordered a April Chair - Antique Bronze. Nicola in Windsor, - has just ordered a June Table - Antique Bronze (6 seater set). Paul in Bridgwater, Somerset has just ordered a Violet Table - White & Champagne (8 seater set).